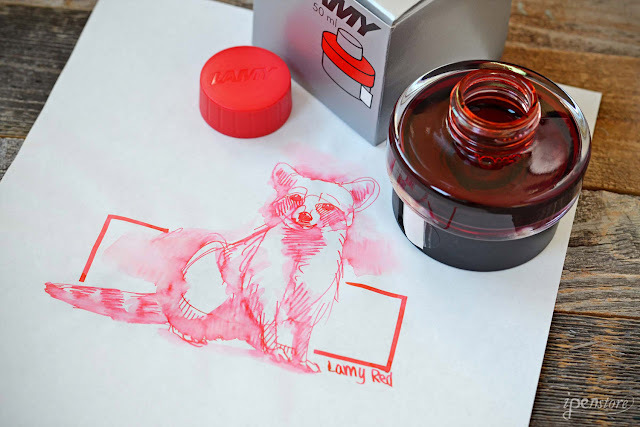 Lamy Red hasn't gotten a lot of love from the fountain pen ink community. I think this is an ink that deserves a second look! First of all, Lamy ink bottles are really cool. They are functional as well as attractive. They are known for being sturdy and impossible to tip over. In the top half, you have your ink with an ink collecting basin so you can get out every last drop of ink. The bottom functions as a dispenser for ink blotting paper. Fill your ink, then use the blotting paper to clean your pen- an ingenious design. Now onto the ink itself. Lamy Red is not a bright true red, it's more of a pinky/orange red. Personally, I like the shade, and there is a place for this shade in my collection of inks. 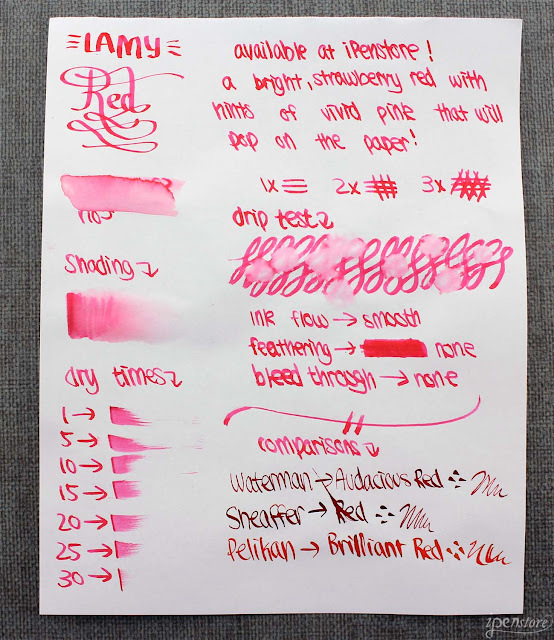 If I wanted a true red I might choose Diamine Wild Strawberry, or Noodler's Eel Rattler Red. But Lamy Red is a nice bright color, if not a true red. The other great attributes of this ink with the low price all add up to definitely make this ink a winner! Price: Only $9.97 at iPenstore!